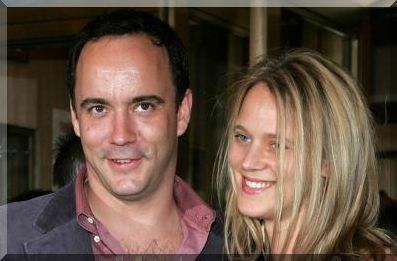 ---The space between the walls of Dave Matthews' house has gotten a bit more crowded. The rocker and his wife, Ashley, are celebrating the birth of twin daughters, according to his band's official website. --- Ashley gave birth to fraternal twins, Stella Busina and Grace Anne, last Wednesday in Seattle with Matthews at her side, his publicist says. The two girls are the first for Matthews, 34, and his 27-year-old wife, who tied the knot in August 2000 after eight years of couplehood. --- No further details about the birth, such as the bambinos' dimensions, were disclosed except that they were "in excellent health," but they did arrive a little early. They weren't officially due until next month--Matthews even built a month-long hiatus into his band's current five-month, 53-city tour that was supposed to kick in next Wednesday and last through the end of September. --- Fortunately for Matthews, he won't be straying far from his family's temporary home base in Seattle, where his wife is studying naturopathy, a form of holistic medicine. (The couple usually reside in Charlottesville, Virginia.) His band plays the Gorge Amphitheater in nearby George this weekend followed by a show next Tuesday at the Delta Center in Salt Lake City. After that he's not due back on the road until a September 29 date at the Verizon Wireless Music Center in Noblesville, Indiana. "As we wind the tour down," he told the Detroit Free Press, "I'll be able to wind up my fatherhood. --- While Matthews hasn't yet commented on the stork visit, he earlier said he expected the kids to dominate his life. "I can't wait to have babies! Nothing else seems important," he told Entertainment Weekly. "I can imagine it's only going to affect me positively," he added in an interview with the Detroit Free Press, "so hopefully it does the same for my career". --- Not that he has anything to worry about, work-wise. His concert trek last year was the third-highest-grossing touring act in the world, raking in nearly $68 million from 63 dates, and his band's latest album, Everyday, debuted at number one back in March and is the latest DMB disc to go muliplatinum. A retrospective of their videos came out on video and DVD this week and the band has another live album due in October. ---After the birth of the Matthews' twins, please from the DMB internet newsgroup (alt.music.dave-matthews) sent a congratulations card to Dave and Ashley, along with a $donation$ to Bama Works. Click here to see the card that was sent.